COLUMBIA, Mo. – Army Staff Sgt. Robert Canine was severely injured while serving in Iraq in 2009. Now, Canine is a MU sophomore studying abroad in Germany and The Netherlands this winter with the help of the Trulaske College of Business and Veterans United Home Loans. The Mexico, Mo. native lost both of his legs below the knee due to injuries sustained in a roadside bomb blast while traveling in a vehicle convoy. Canine, a business administration major, is able to walk using prosthetics; however, he is only able to use them 12 to 16 hours a day before needing rest. He approached Stephen Ferris, the trip’s organizer and a professor of finance in the Trulaske College of Business, to discuss if he would be able to participate in the trip and its activities. Ferris reassured Canine that he would be able to rest if necessary and encouraged him to apply to the program. Approximately 60 students will go on the trip departing Dec. 28 and returning Jan. 11. Students prepare for the trip by taking an eight week course on international business. Once in Europe, students visit with three firms in Amsterdam and three in Berlin, and interact with managers at each firm to increase understanding of international business. Students are expected to learn how companies in the European Union interact with those in the developed and emerging economies of Asia and Latin America. In Europe, students will complete assignments and attend courses to identify differences in business practices between the United States and Europe. Outside of business activities, students are immersed in the culture through sightseeing and visiting cultural and historic sites. The U.S. Department of Veterans Affairs pays for all of Canine’s educational expenses. 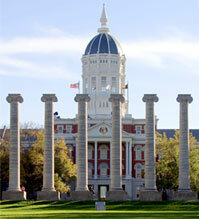 However, the program could only pay for the tuition associated with the study abroad course. This left him with nearly $4,000 in expenses including lodging and airfare. After learning of this roadblock, Ferris approached Columbia-based Veterans United Home Loans, and the company donated $4,000 to cover Canine’s lodging and airfare. Then, to cover food and miscellaneous expenses, Ferris worked with the Trulaske College of Business International and Study Abroad Programs office to grant Canine an additional $750 scholarship in exchange for work as a teaching assistant on the trip. Canine lives in Columbia with his wife, Jennifer, and son, Sebastian. Outside of school, Canine volunteers with Big Brothers-Big Sisters and Segs4Vets. After graduation, he aspires to go into sports or non-profit management.